What do you do when you go back to your home town for a visit? Well, of course, you see family and friends. And you eat…a lot. And you drive by your old haunts. And if you’re like me, you go to a thrift store or two! So, I had to head to the antique store in town, right on Main Street. 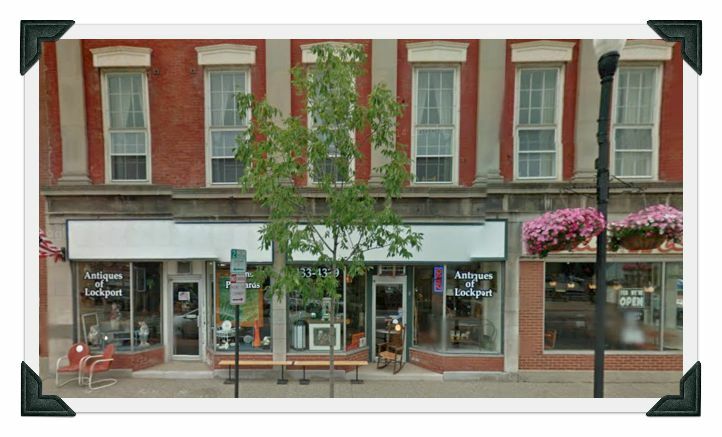 This older Google photo still shows the Submarine sandwich shop on the right. (I get hungry just thinking about their steak subs!) That shop went out of business a while back and the store front is now part of the antique store. 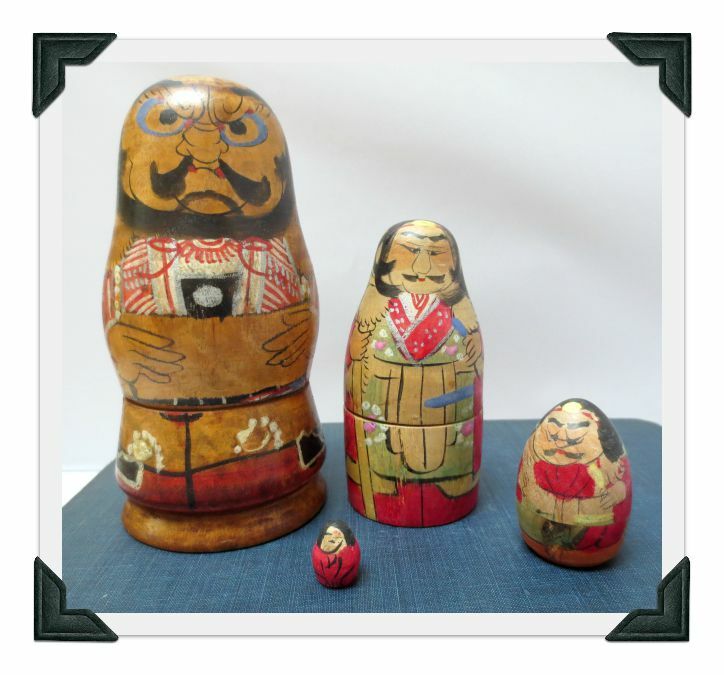 The antique store is three long rooms crammed with dozens and dozens of dealers so you never know what you’ll find. By the end of my five-day trip, I had been there twice! 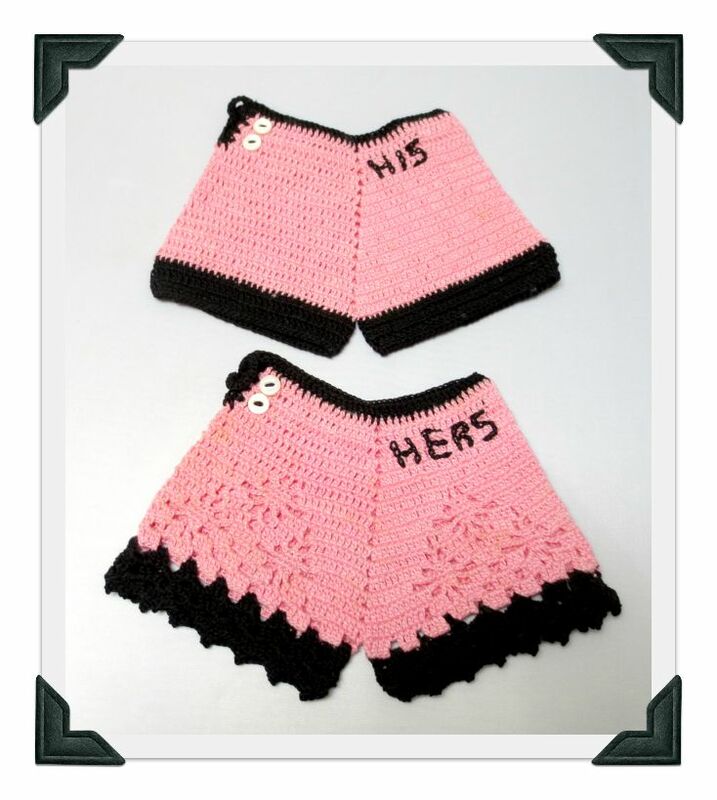 One of the first things to hit my basket was this 1940s/50s set of vintage His/Hers pink and black crocheted potholders. 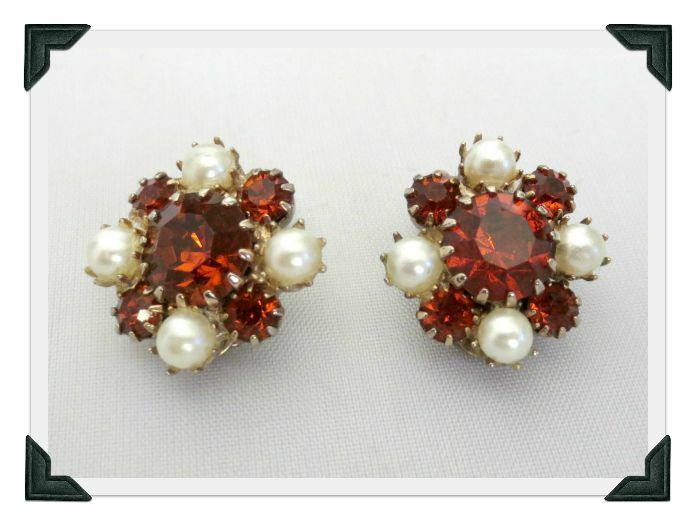 Can’t you just picture these in a retro kitchen? I also found a wonderful blue and cream woven blanket/coverlet. It was dated 1836 in the weaving, but I doubted that was the real date it was made. It just didn’t feel old enough. It had a tiny bit of damage, but was so attractive, I decided to spring for it. 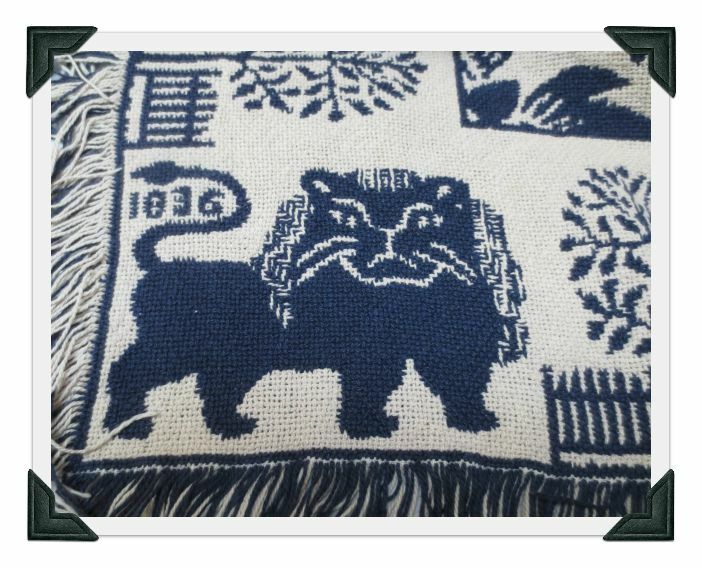 Later my research indicated that it was very similar to woven blankets made by Harry Tyler in the 1800s, but (and this is a big but), the lions are different and usually the owner’s name and/or location was woven in the blanket and the details are much crisper. A real Harry Tyler woven coverlet. 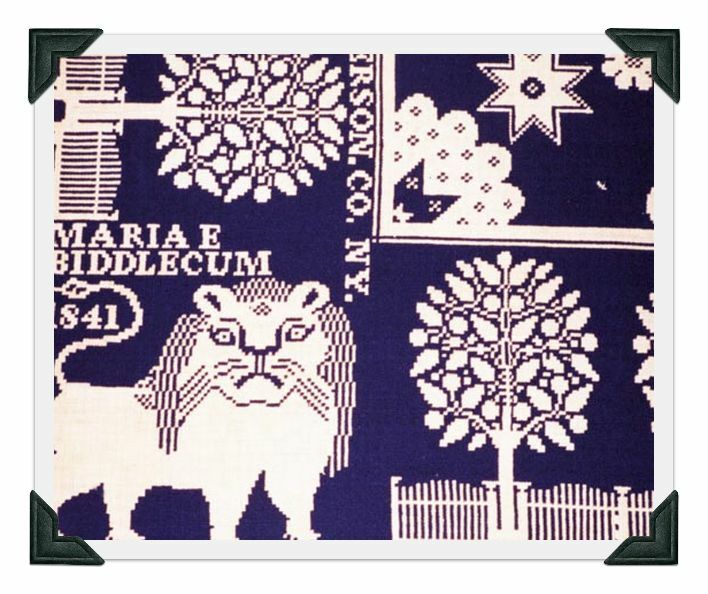 More research revealed that my blanket is indeed a reproduction sold in the 1980s by the Historic Williamsburg Gift Shop. Even so, one of these repro blankets (in used condition) sold for $107 a few years back, so I should do okay with it!! 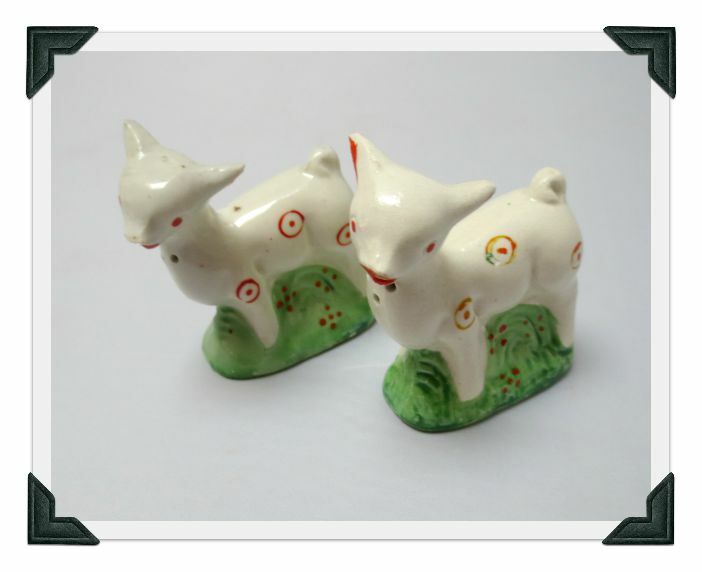 Next I bought these goofy, I mean cute, lamb salt and pepper shakers. Not worth much but they had been marked down to $2.50, so I couldn’t resist. 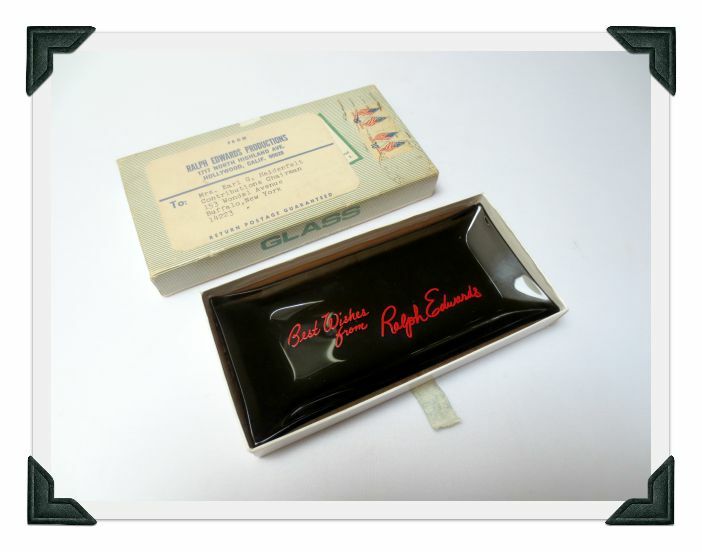 I almost passed by this little glass tray, but when I saw that it was in its original mailing box from Ralph Edwards Productions, Hollywood, well I was sold! Turns out this production company was best known for producing This Is Your Life and Truth or Consequences. Haven’t been able to find a similar tray for sale. Just seems like a cool piece of memorabilia. Also bought some pretty Weiss earrings. And in a few weeks I’ll be ending my job and am so looking forward to this next stage of life! Hope to add these items to my Etsy store soon!